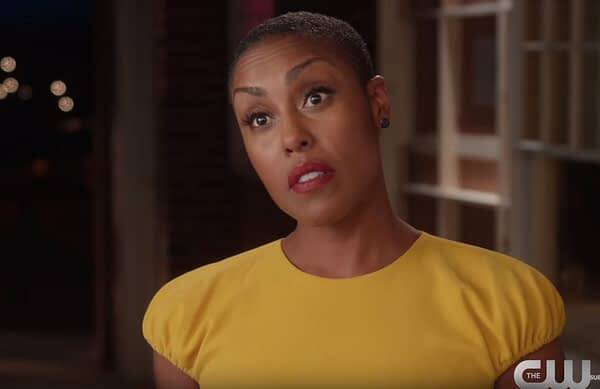 As Black Lightning got its premiere in Washington DC this weekend and will make its television debut on Tuesday, the CW has released a new interview/character introduction video featuring actress Christine Adams telling us about her character of Lynn Pierce. Lynn is the ex-wife of Jefferson (Cress Williams) and the most of Anissa (Nafessa Williams) and Jennifer (China Anne McClain). We see in the video that Lynn is one of the few people who know that Jefferson was also Black Lightning. And while she understood his need to go out and protect the streets, she didn’t want to be the one waiting at home, wondering if he was going to come back alive each night. They were high school sweethearts that got married and started a family, only to separate as many couples do. But they seems to still have a good relationship and genuine affection for each other. The family dynamite is going to play a huge part in this series, and this is a type of relationship we don’t see a lot of on television. Adams has quite the genre background having appeared on Stargate SG-1, Doctor Who, in the film Batman Begins, Pushing Daisies, Terra Nova, and nine episodes of Marvel’s Agents of SHIELD. Black Lightning debuts Tuesday, January 16th at 9 p.m. ET on the CW.